For my last blog from CES, I am starting with a product that caused the quite the stir at CES. Then I will focus on a product for pet lovers and finally three different backpacks that I would want to get myself. The controversy came with the Osé product, which is advertised to promote hands-free, blended orgasms for women. It is put forward by a women-run startup, that is determined to “change the face of pleasure products”. 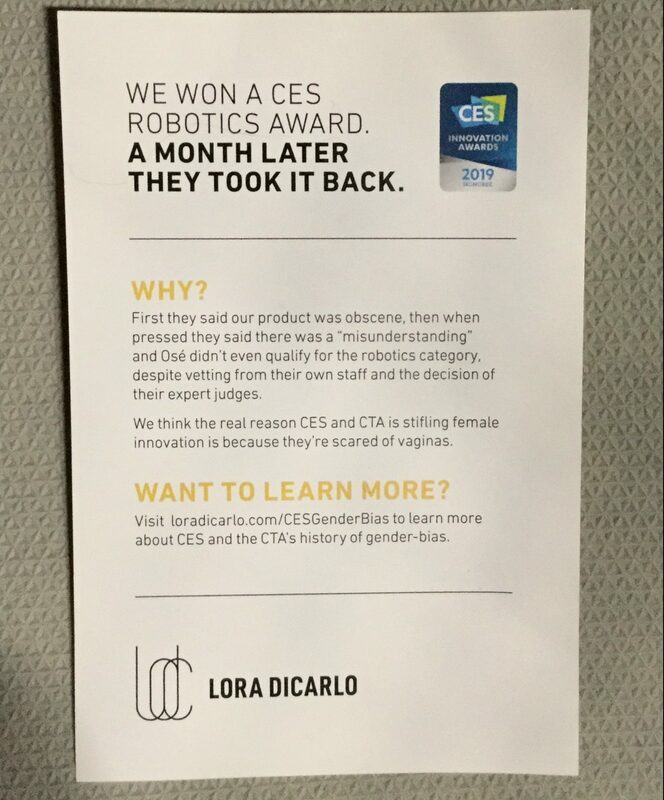 As I mentioned, the product created a stir after CES organizers cancelled the innovation award it had been awarded as the organizers deemed it “immoral”. Lora DiCarlo, the creator of Osé, liberally distributed information cards (shown below), and many news media including CBC, Fortune, and Wired to name a few, covered the retraction of the award. The CES organization’s intentions seemed to have backfired in light of the retraction. Its position on the alleged impropriety of the product is hard to accept when it has allowed a similar device created by Ohmibod to exhibit at CES for each of the past 5 years. The messaging from Lora DiCarlo is powerful. It will be fascinating to watch how CES wiggles their way out of this self-inflicted dilemma. Personally, I feel that allowing Ohmibod but not Osé to participate at CES, really shows the CES organizers creating a double standard. This is yet another example of gender bias at CES and in the tech industry. Its no wonder that women are getting turned off (sorry for the pun) from entering the technology field, resulting in a year over year decrease of women in the tech industry, when the world’s largest technology show clearly ignores a women-led organization providing a device for women. Less controversial is a product for cat and dog lovers. 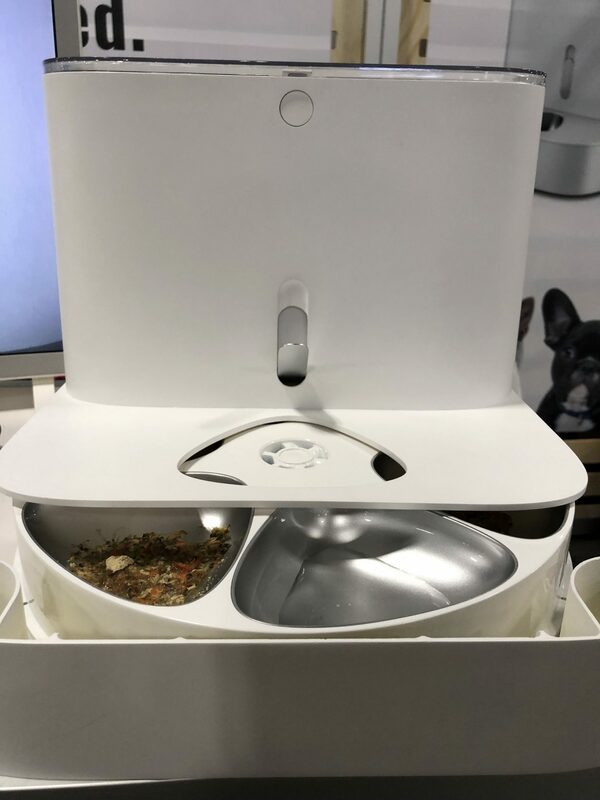 Feeder 101S demoed a smartphone-controlled pet food dispenser. The feeder is equipped with ‘Re-hydration Technology’ and can dispense freeze-dried, dehydrated, and powdered pet foods. Feeder also keeps a dietary log and provides a health monitoring service as well as custom dietary care solutions. It will be available in Q3 this year at a projected cost of $160-180 USD. 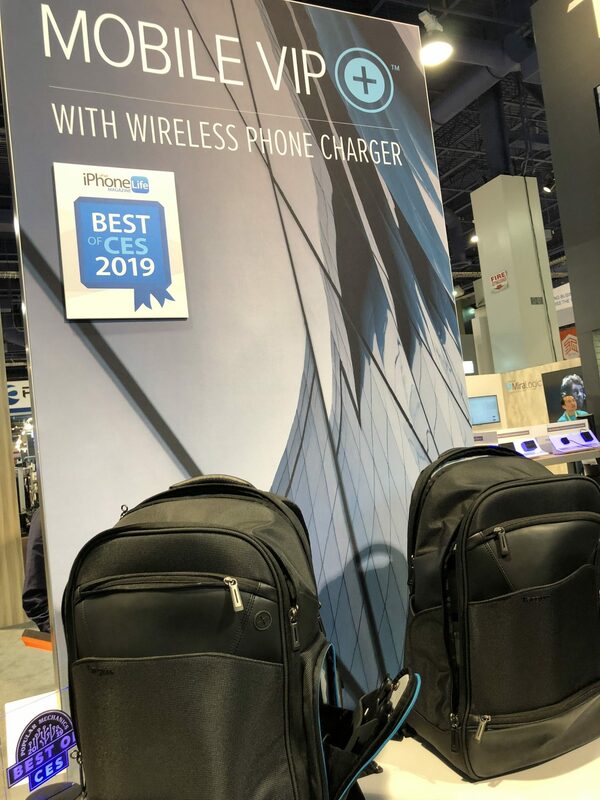 While at CES, I also checked out a number of backpacks. The following are the three I liked the most. 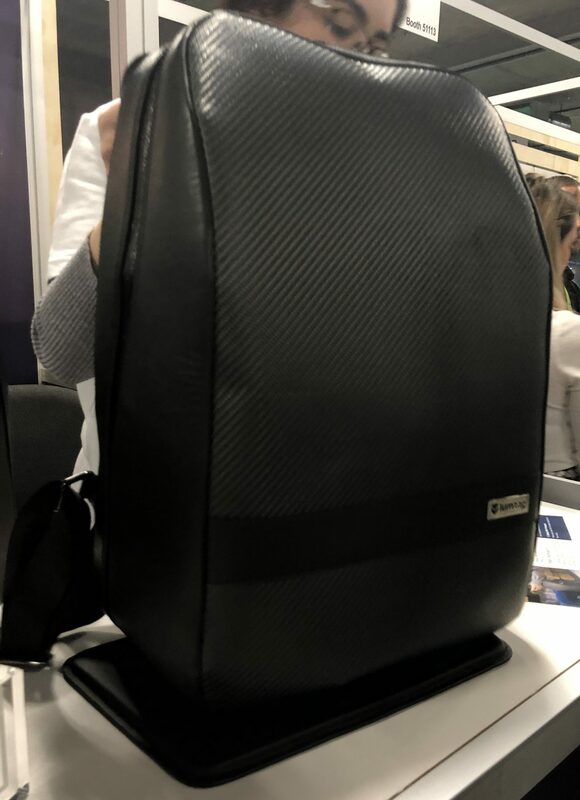 The Targus Mobile ViP Backpack completely opens up and lays flat. The main impetus behind the design is to facilitate quick airport security screening and because you can fully open the pack you do not have to remove tablets and laptops from the pack as it is going through the security screening conveyor belts. It has compartments for all my cables and gadgets. The SafePort Sling keeps the laptop secure in case the backpack is dropped. It stands upright when placed on the floor as well as having a trolley strap. It’s $99 and is available now. The BG Berlin metrobag anti-theft backpack is a very secure backpack. 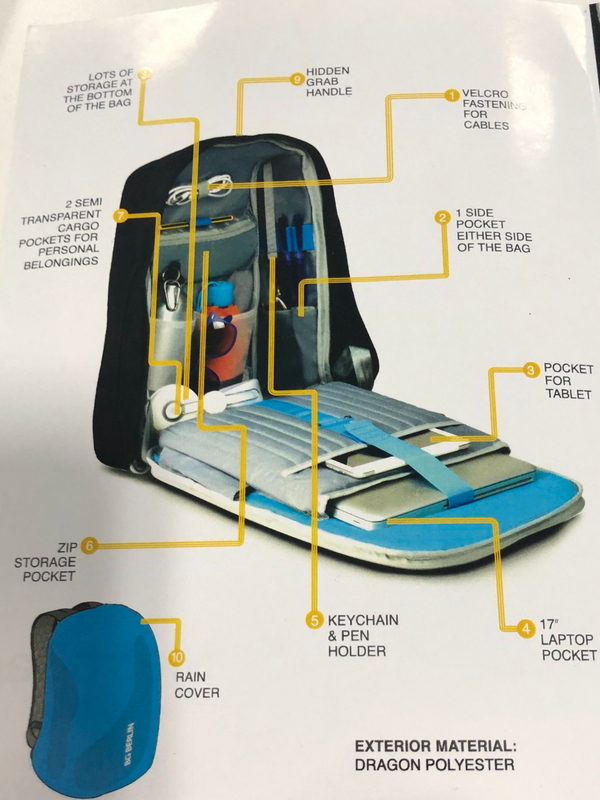 The zipper is in the back and the backpack has no outside pockets but has two hidden quick access pockets on the side next to the strap for easy access. It has a night reflection feature for walking at night as well as a trolley strap for ease of carrying plus a USB charging port to connect with a power bank. It is the lightest of the three backpacks. It is available now at $129 CAD at a number of different locations including CAA. Lumzag is not an ordinary backpack. It is described as the world’s smartest bag. When you open the backpack an interior light comes on. The app that comes with the bag which sends an alert each time someone opens the bag. It also tracks the content, for example, if you remove your passport it sends a message to the app and a reminder about the missing passport. It also has a back view camera to monitor what is going on behind you as well as a real-time GPS tracking system. It has a wireless charger and power bank that charges your phone and tablet wirelessly. With all these features one wonders why it wouldn’t have a trolley strap. It will be available later this year for $289 USD for the uber paranoid users out there. And that is it for my blogs from CES 2019. It was interesting but overwhelming. There is no way anyone could visit all of the over 4,000 booths. 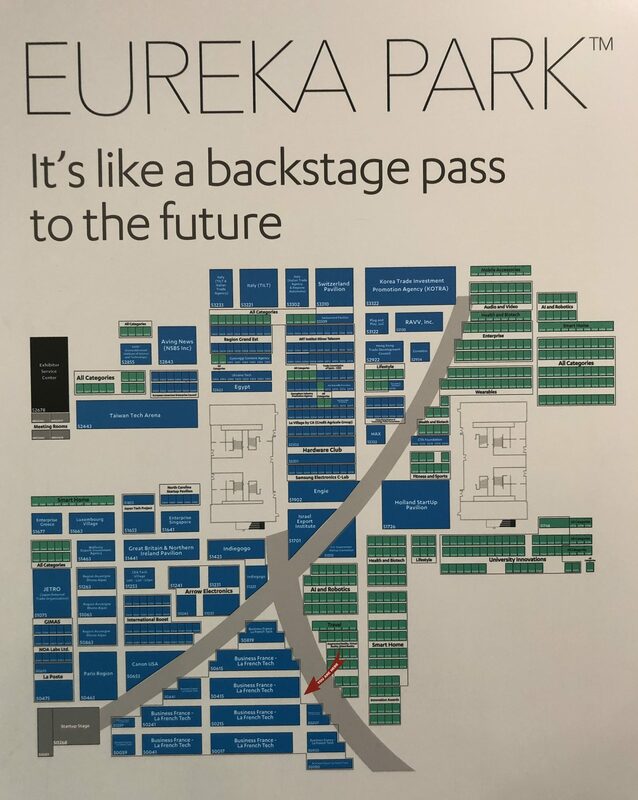 I spent most of my time at a part of CES called Eureka Park that houses all the startups. One thing I found really interesting was seeing that many counties including France, Holland, Israel, and Taiwan had special areas within the park but Canadian did not.